A few weeks ago, Prime Minister Ranil Wickremesinghe visited the Rajagiriya overpass construction site, built under the Road Development Authority. The PM also informed that the Rajagiriya flyover would be formally opened to the public on 8 January, nearly one year ahead of schedule. The new flyover will reduce the traffic slow-down experienced by the travellers between Borella and Jayewardenepura on Parliament Road. Construction commenced on 31 August 2016 and the 533m-long, 3.5m-wide, two-lane fly-over in two parallel bridges was expected to be completed in two stages; the first bridge by November 2017 and the second by December 2018. The project was funded with a soft loan from the Government of Spain and the design and supply of the superstructure awarded to Centunion S. A of Spain (the main contractor). The design and construction of substructure, fabrication, installation and erection of the superstructure was subcontracted to Access Engineering PLC. The flyover was estimated to cost Rs. 4.3 billion. Although the Prime Minister congratulated the contractor for speedy completion, public reactions are different. During construction period, vehicle drivers complained of additional delays with lane restrictions due to construction needs. Meanwhile, others complained of quality of construction. Especially critical was Sanuj Hathurusinghe; in his article in a newspaper on 27 August 2017, he complained of misalignment between the first Y-shaped pillar and the bridge frame. I quote: “The pillar and the steel frame looked well off when the frame was first placed on top of the erected pillars and was clearly visible. Soon followed social media posts and photos regarding the misalignment and questioning its stability. Since then, the builders appear to have taken measures to address the issue in a manner of placing two circular metal plates on top of the pillar, significantly scaling up the surface area of the pillar-top on which the bridge frame is placed. It cannot be comprehended how can a misalignment happen; in construction works setting out a structure for piling, foundations and Y-structure top should have been done with GPS technology in surveying (commonly used today), which allows an accuracy of one thousandth of a mm. Setting out is done by the contractor’s surveyor and checked by the resident engineer’s (overall responsible on behalf of the client) surveyor. Steelworks for the superstructure was designed and fabricated by the Spanish contractor; but was the design checked by the RDA and steel and fabrication quality checked and certified by an international consultant? If not, quality issues could arise. The public can remember when the Dehiwala flyover was built by Access (with steel beams from the same supplier? ), the structure wobbled so much that heavy vehicles are not allowed to-date. The contract for the 533m long flyover commenced on 31 August 2016 in two parallel bridges to be completed in two stages; first bridge by November 2017 and the second by December 2018; a contract period of 28 months. Is allowing 28 months for a 533m-long flyover reasonable? In the case of flyovers, unlike a bridge across a river, the entire ground is accessible, allowing the contractor to simultaneously work over the project area. A number of piling machines could be used simultaneously and columns be ready to accept when components arrive from Spain. 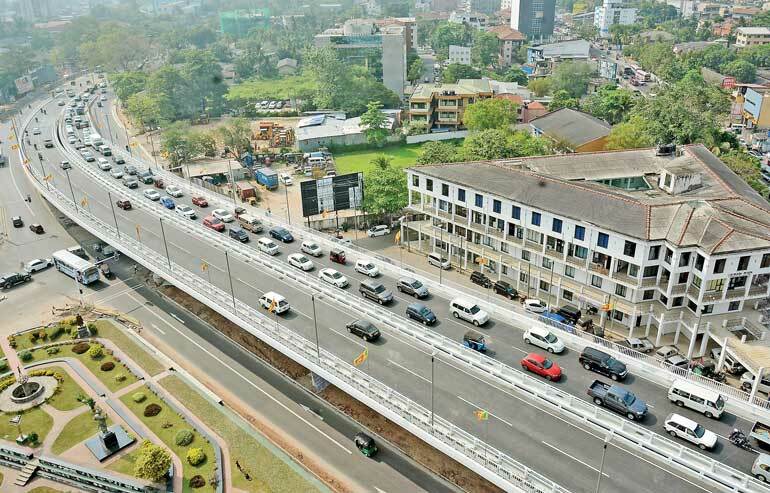 In comparison, the 325m-long Kelaniya flyover awarded to the same contractor was allowed nine months (1 December 2007 to 30 August 2008), but the first phase (two lanes) was completed and opened to traffic in a record 60 days. The Rajagiriya flyover is 1.64 times of Kelaniya, should be completed in 14 months or shorter (considering single mobilisation), but was allowed 28 months, double the time. The above shows the contractor had been allowed an undue lengthy construction period, but considering heavy traffic on Parliament Road demanded shortest construction time. Thus, the contractor completing the flyover in 16 months vs. being allowed 28 months does not reflect efficiency of the contractor. It only shows the inefficiency (or corruption) of the client, RDA. When the contract allows 28 months, if there are any delays, the contractor would be subjected to delay penalty calculated by the day. Similarly, when the contract is completed earlier, the contractor would be eligible for a bonus at the same rate as the penalty. Thus by completing the contract 12 months ahead of schedule, the contractor will be eligible for a huge bonus; the result of poor contract administration by the RDA, or was it deliberate? Let us look at some other contracts in the past. The construction of an expressway from Peliyagoda to Katunayake to the east of existing Colombo-Negombo road was proposed by President Premadasa in 1989. The selected route avoided marshes, passing over highlands, ending near the Free Trade Zone with a connection to the airport. However, the project got suspended when the court decreed that an Environmental Impact Assessment (EIA) report needed to be prepared and accepted prior to construction. The proposed four-lane dual-carriageway, designed for 100 kmph, was estimated to cost Rs. 5,544 million or $ 110 million in 1991. The entire design and technical aspects were carried out by Japanese. The Expressway route was finalised, designs completed, EIA accepted and RDA commenced acquisition of property when Premadasa’s demise on May Day 1993 stopped all works. The Expressway route was a hot topic during the presidential elections 1994, with Chandrika Kumaratunga promising to abandon the land route and shift the road over the Muthurajawela marshes. Kumaratunga won the elections and instructed the route to be moved. Following international tenders, the construction of revised expressway was awarded to Daewoo-Keangnam joint venture from Korea in August 1999 for Rs. 9,516 million, shortly before the presidential elections where Kumaratunga was re-elected. Koreans were not the lowest tenderer and the award was marred by allegations of corruption. The Koreans pumped a large volume of sea-sand for filling the road base. In November 2001, just before the elections, people of Uswetakeyyawa protested against sand dredging that disrupted their fishing. The Police opened fire against the protestors, killing three and seriously injuring two. With political changes Ranil Wickremesinghe was appointed Prime Minister in December 2001. The tight monetary policies of the new Government reduced payments to the contractor and the progress slowed down, resulting in termination in January 2003. The contractor claimed to have dredged 1.5 million cubic metres (MCM) out of 4.7 MCM required. Rajapaksa, voted into power, wished to recommence the long-delayed project with Chinese funding. The Korean contractor terminated earlier reappeared and in settlement was paid Rs. 2,794m. Other expenses as consultancy and land acquisition reached Rs. 2,650m, totalling expenditure to Rs. 5,444m. The contract was awarded to China Metallurgical Construction Group Corporation (MCC) in May 2008, for $ 310 million (Rs. 35,600 million) to be completed in 39 months. The Chinese Government funded $ 252 million and the balance was by the Sri Lankan Government. The most important factor of any project is the cost. The expressway proposed in 1991 was to cost only Rs. 5,544m or $ 110 million. However, the cost of the completed expressway amounts to over $ 342 million. In addition the failed Korean contractor cost the country Rs. 5,444m. Resulting total costs Rs. 50,444m or Rs. 50 billion, almost a tenfold increase. The Port City proposed by the Chinese developer and approved involved reclamation of 233 hectares (Ha) or (576 acres) from the sea bed. Reclaimed lands were allocated as 125Ha to Sri Lanka, 108Ha to the developer, of which 20Ha as freehold and 88Ha to be sold to potential investors on 99-year lease. Also 63Ha reserved for roads and parks. The project estimated to cost $1,337m commenced in September 2014. During the run-up to presidential elections, the project faced severe criticism and Ranil Wickremesinghe informed that, if the Opposition won the 2015 presidential elections, they would scrap the project. After winning the elections project was suspended in March 2015, claiming that environment approvals obtained were not proper, and the project company was requested to submit documents for approval within two weeks. The company submitted the requested papers within two working days, also claimed losing $ 380,000 per day. The project employed approximately 1,000 direct and 4,000 indirect employees, almost all Sri Lankans. In addition over 200m of the breakwater constructed had been damaged during suspension. As per the developer, he has followed the correct procedure and obtained all legal requirements and approvals for the project. Only the tax holiday agreement needed to be accepted by Parliament, but the new Government refused to submit the papers to Parliament. As such, a tax holiday would be in question, but the construction is legal. During the suspension, a Supplementary Environment Impact Assessment was submitted in December 2015, also proposals were revised. Freehold lands to developer was deleted and the reclaim area increased from 233Ha to 269Ha. Under the revision, public areas increased from 63Ha to 91Ha, compared to 5.7Ha at Galle Face Green. After negotiations Port City construction recommenced in March 2016, one year after the suspension. According to the developer’s initial claim of losing $ 380,000 per day, one year suspension would have cost the developer $ 138.7 million. If the project was scrapped, the developer would claim total costs incurred in planning as details of sea depths in proposed development area and sand mining regions, studying sea-sand movement, model analysis of proposed structures, design layout of proposed structures, investigating into construction materials as sea-sand and rock and preparation of EIA report. The developer had hired the world’s most competent consultants in architectural, structural, landscaping, financial, marketing and promotional costs would have been enormous. In addition, interest costs during the suspension period would be payable. Although the developer did not publicise the claims made, it is apparent what changed the mind of PM and the President was the huge liability in paying compensation if the project was scrapped as boasted. Immediately after recommencement of the project, the President followed by the Prime Minister visited China and had meetings with the Chinese President Xi Jinping. After the visits the developer announced: “In view of the goodwill created by the visits of the Sri Lankan President and the Prime Minister to China, the project company has agreed to withdraw all compensation claims for losses incurred due to the suspension of the project.” What really happened was anybody’s guess. Phase I of Hambantota Harbour officially opened on November 2010. The unused 17m deep harbour capable of handling large container ships received severe criticism, and SLPA diverted vehicle shipments to Hambantota from June 2012. Phase II with four deep-water berths was completed in mid-2015 and idled. The failure to utilise Hambantota Port for container handling resulted huge losses and no attempts were made by SLPA to equip the port. When bids were called for the second time for operation of South Terminal of Colombo South Port in February 2009, China Merchant Holdings (CMH) submitted the only bid, but the royalty fees offered was around 50% of the first round. SLPA renegotiated with CMH to increase royalty payments. During negotiations, SLPA agreed to guarantee a minimum volume of TEUs for 20 years. To achieve same, SLPA agreed not to handle containers in Hambantota until targets were achieved. It was this condition that prevented Hambantota harbour from handling container cargo. Who was responsible for the clause in the agreement which cost the country billions and forced the Government to sell Hambantota Port to Chinese? Coal-based Norochcholai power plant was commissioned in 2011, but the power-plant broke down frequently and CEB engineers blamed the poor quality of Chinese power plant. Establishment of a coal-fired power plant was proposed since the 1980s and dragged on until President Rajapaksa decided to obtain Chinese assistance for the Norochcholai power plant, and the MOU was signed in 2004, which was a political decision. A 20-year delay would have allowed CEB engineers to read, study, visit, discuss and understand technicalities of coal-based power generation in detail. China produces machinery of varying quality from cheap to high quality for the US and European markets. Purchase agreement for the plant was signed in September 2005 by the CEB General Manager and the President of the Electrical Engineers Association. The year-long period allowed CEB assisted by a foreign consultant and Chinese to discuss and finalise the technical specifications for the plant. Large power plants are specifically built to suit customer requirements, referred to as specifications. For a power generation plant, specifications could be lengthy, would include details of material quality, manufacture of components, installation, routine tests, tests in owner’s presence, spares, guarantees, etc. CEB engineers, having purchased generating plants over the decades, would be conversant of the procedure. Although inexperienced in coal-powered generators, they had two decades to study and employed an experienced foreign consultant. During the manufacturing stage of the plant, consultants operate world-over including China, who track the manufacturing process and ensure that the plant is manufactured to the client’s specifications. Thus Norochcholai power plant supplied by Chinese was as per CEB requirement and CEB engineers are solely responsible for plant quality. The International Federation of Consulting Engineers (known as FIDIC, acronym for its French name Fédération Internationale Des Ingénieurs-Conseils) is best known for the FIDIC family of contract templates since 1913, and covers practically all forms of contracts imaginable. The FIDIC Red Book covers construction. Usage of FIDIC templates require payments and RDA has own Conditions of Contract, prepared generally based on FIDIC to suit local conditions. Most international contracts are based on FIDIC and gives a fair solution when disputes occur between the employer and the contractor. Entering into agreements whether construction or purchase involving billions of rupees is a serious matter, but as shown above senior engineers and heads of departments enter into agreements creating disastrous situations. Moreover, politicians boast of cancelling signed contracts without understanding repercussions. We have witnessed unfair conditions supporting the contractor in the Rajagiriya flyover, an unfair extended construction period allowing the contractor to claim a huge bonus. Also were the steel components manufactured checked as indicated for Norochcholai plant? Problems of alignment would not happen if the resident engineer acted properly. The public would recall a few months ago RDA engineers supervising large contracts were demanding a Rs. 600,000 monthly salary. In Katunayake Expressway construction, shorter, the low cost route was modified to an expensive route over Muthurajawela for political advantage. The original design was carried out by the Japanese and funding was available from Japan, the only country prepared to give development aid to Sri Lanka at the time. The amended contract was awarded not to the lowest bidder for other reasons. The next Government curtailed the project due to insufficient funds. When the project was awarded to a different contractor, a huge claim had to be settled. Finally, the cost of the highway increased tenfold. Scrapping Port City was good political propaganda prior to elections, but attempting to implement opened eyes to massive claims payable. Finally, political leaders had to crawl to the Chinese President, which gave Chinese an upper hand in dealings with Sri Lanka. Billions of dollars invested in Hambantota Port had to be sacrificed to get few millions in Colombo South Harbour. Who prepared and agreed to the new clause in the agreement? Norochcholai is a good example of the poor technical, administrative capacity and commitment of CEB engineers who continue to hijack the country for their personal benefit. Our country is financially poor, mostly due to failures in contract administration, knowledge and experience in the field. How many of our professional lawyers in high positions are aware of FIDIC conditions of contract? We cannot expect politicians to acquire such knowledge. Until our senior advisors acquire themselves with contract administration knowhow, the country will continue to pay the price.